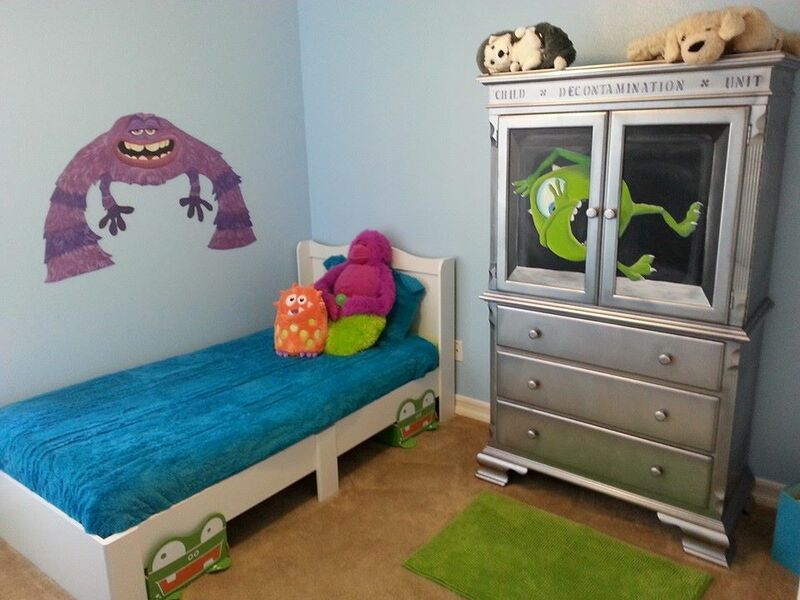 Boo...We think Noah's Child Decontamination Unit is going to be on the future request list... this room is a show stopper for all the right reasons! Noah, a beautiful 2 year old with a love of Disney was born with Tuberous Sclerosis Complex, a genetic disorder that causes benign tumors to grow in the brain and other organs. It can lead to seizures, developmental delay, and kidney issues. Noah’s biggest current challenge is that his internal clock is affected and he is often up at odd hours of the night getting into mischief. His sensory needs cause him to create little nests; and he carries a bunch of tiny baby blankets around he calls “babies” to self soothe. 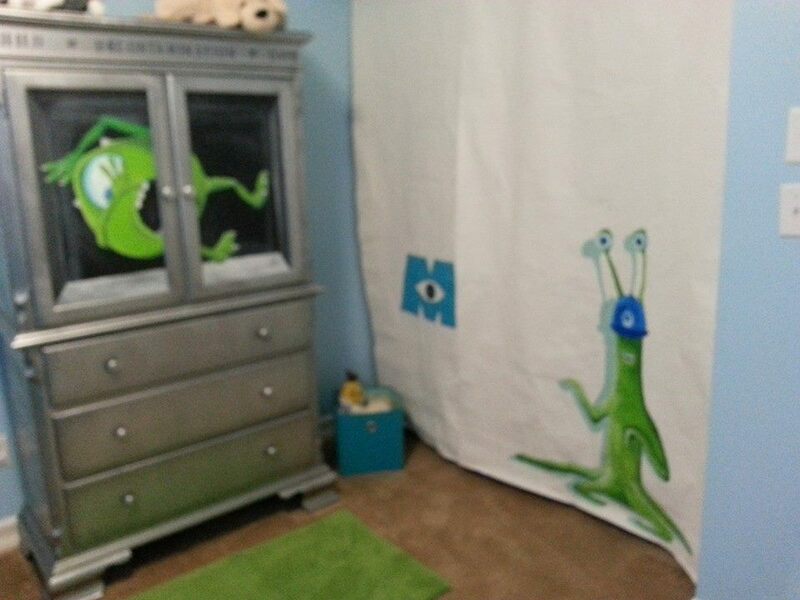 Noah also has a gift for getting into and out of spaces, so his teacher recommended Noah for a room makeover. Safety gates for his play spaces and bedroom window were installed a month before the makeover by Baby Home Safety to ensure those areas were protected immediately. Noah’s dad is in the military and the family is fortunate to have received Category 5 status, which means Noah’s dad won’t be stationed away from home due to Noah’s complications and his need to be near a children’s hospital. Noah is also lucky to have two loving big brothers to help Mom when Dad is on duty! 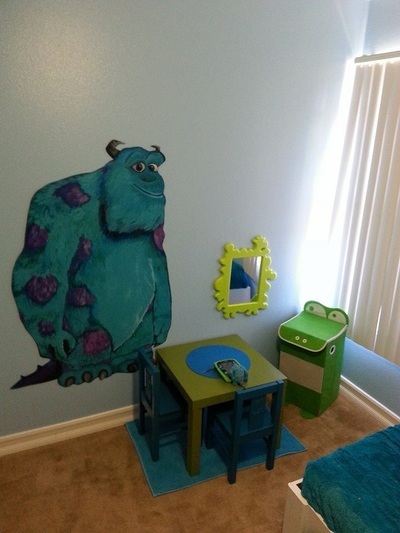 Noah and his brothers enjoy going to Disneyland; and we used his love of Monster’s Inc. as the theme for his room. Monster’s Inc. has a lot of scaly and furry friends to add to the sensory dimension of Noah’s room. Artist Emily Dolton, whose son Aidan also loves to nest, served as both artist and project lead. She decided to turn Noah’s closet into a sensory play zone. 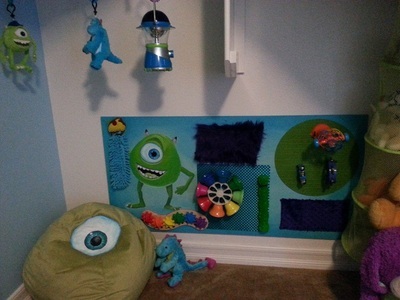 Emily called Stephen Bair of Bair Works to help her create a sensory board and to install the fabric closet doors so that Noah could safely pull at the fabric and not hurt himself. The sensory board was created with toys from Lakeshore donated by the Williams family. Sarah Williams is a Behavioral SET and Cecily’s Closet volunteer who understands the need for a calming spot to play! The final touches were an Imaginarium camp light that projects a nighttime sky and a lime green beanbag that Emily embellished with a giant Mike Wazowski eyeball! Laura Cross of Bassett really knows how to arrange a space! She also helped make the room safe by thoroughly locking the clothes away with expertly installed safety latches. The armoire was transformed not a Child Detection Agency “Decomtamination Unit” by Emily. 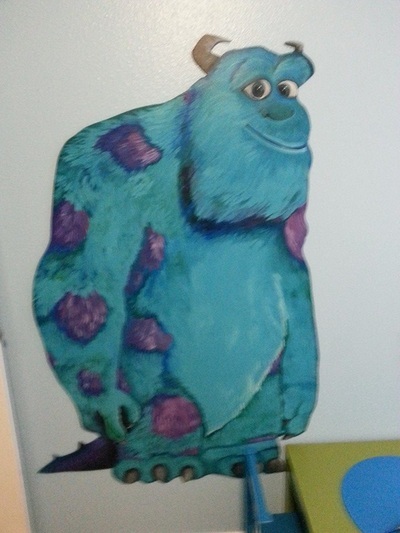 Emily also added hardboard murals of Sully and Art so that they can move with the family. Victoria Johnson, a talented Madison High Senior, helped with all the underpainting of the creatures. Noah graduated from a crib to a big boy bed. A furry comforter was chosen not only because it worked with the theme, but also added another texture. Area rugs in various materials and weaves and mats with rough and smooth surfaces added to the “Touch Me” elements of the room. Colorful organizers were added to the closet and underbed spaces to give mom places to put toys and “babies”. Special thanks to Rancho Sante Fe Woman’s Club for their commitment to helping military families affected by special needs! Their generosity made our 66th room a reality!